See Great Artesian Basin for the water source in Australia. 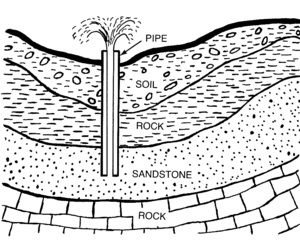 An aquifer is a geologic layer of porous and permeable material such as sand and gravel, limestone, or sandstone, through which water flows and is stored. An artesian aquifer is a confined aquifer containing groundwater under positive pressure. 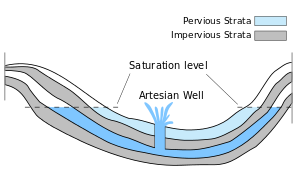 An artesian aquifer is trapped water, surrounded by layers of impermeable rock or clay which apply positive pressure to the water contained within the aquifer. If a well were to be sunk into an artesian aquifer, water in the well-pipe would rise to a height corresponding to the point where hydrostatic equilibrium is reached. A well drilled into such an aquifer is called an artesian well. If water reaches the ground surface under the natural pressure of the aquifer, the well is termed a flowing artesian well. Fossil water aquifers can also be artesian if they are under sufficient pressure from the surrounding rocks, similarly to how many newly tapped oil wells are pressurized. From the previous statement, it can be inferred that not all aquifers are artesian (i.e. water table aquifers occur where the groundwater level at the top of the aquifer is at equilibrium with atmospheric pressure). The recharging of aquifers happens when the water table at its recharge zone is at a higher elevation than the head of the well. Artesian wells were named after the former province of Artois in France, where many artesian wells were drilled by Carthusian monks from 1126. 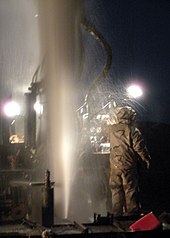 Wikimedia Commons has media related to Artesian wells.